This study examines the dynamics of a population of stingless bee colonies in the seasonal tropics of Guanacaste, Costa Rica. The community in a forest remnant was compared with that in surrounding deforested areas. During this 4-year study, a total of 192 wild stingless bee colonies were recorded, belonging to 14 species. Population dynamics were highly seasonal. Colony mortality peaked at the end of the wet season (October–November) while colony reproduction was most frequent during the dry season (December to April). Colony survival was not lower in founder colonies compared to established colonies. The most common species, T. angustula, had a much lower probability of annual survivorship in the forest (P = 0.74) than in deforested areas (P = 0.92). This results in an estimated colony life span for T. angustula of 3.8 years in the forest and 12.5 years in deforested areas. T. angustula should swarm once every two years to maintain its forest population, but only once every 12.5 years to maintain its population in the deforested areas. 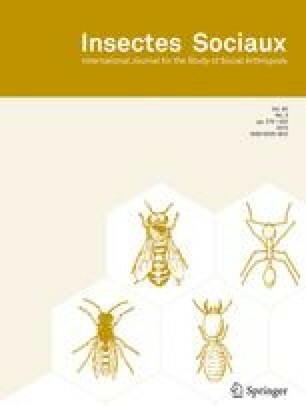 Survivorship of all other stingless bees was similar in the forest and deforested areas and did not significantly differ among the species. The average annual survivorship probability of these species was as high as 0.96, resulting in an estimated colony life span of 23.3 years. On average only one swarm per 20 years is needed to maintain their populations. Life history of the sympatric Africanised honey bee clearly differed from that of the stingless bees, with much lower annual survivorship probabilities for both founder (none survived) and established colonies (P = 0.33). These figures support the general idea that stingless bees invest more in colony survival rather than reproduction, but also show that life history is affected by both species and location. Received 27 October 2004; revised 8 March and 15 June 2005; accepted 5 July 2005.